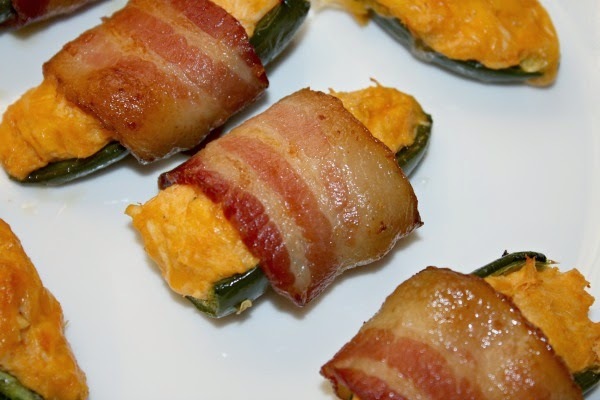 Buffalo Chicken Dip & Jalapeno Poppers Wrapped in Bacon from Home. Made. Interest. ~ Diane's Vintage Zest! 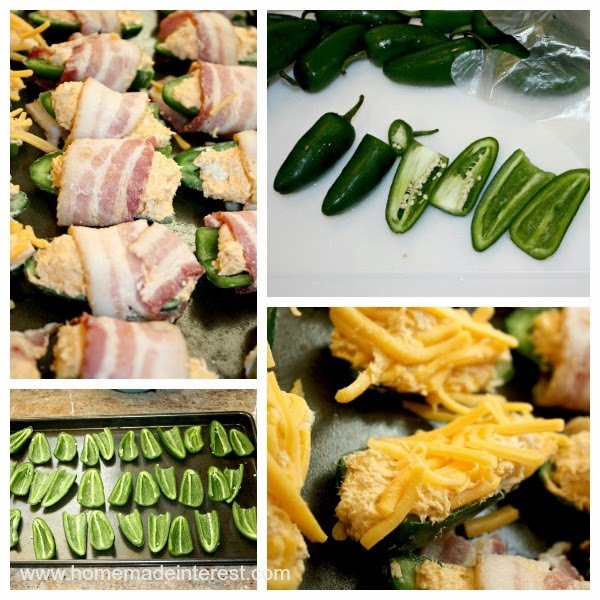 Buffalo Chicken Dip & Jalapeno Poppers Wrapped in Bacon from Home. Made. Interest. Check out their two awesome recipes below! Hi all! We're Kat and Melinda from Home. Made. Interest. and we're so excited to be guest posting on Vintage Zest today! Melinda and I were sitting around the other day talking about recipes, trying to come up with something different...but still delicious, when we came up with these buffalo chicken jalapeño poppers. Buffalo chicken is one of our favorite, easy-to-make, dips and it is loaded with hot sauce, and cream cheese. It seemed like the perfect thing to stuff inside of a jalapeño, especially if you like things spicy! We decided to wrap it in bacon because, well, obviously everything is better wrapped in bacon :). First things first, you need some Buffalo Chicken Dip. Start by boiling chicken breasts until they are cooked through. This usually takes about 15 minutes. If you are unsure about it being cooked through go ahead and cut into it, the meat is going to be shredded so a few slices won't hurt anything. 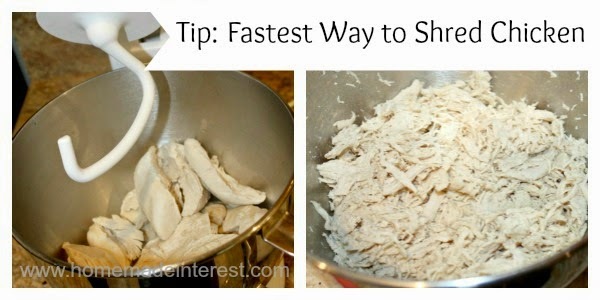 Once the chicken is cooked through the meat needs to be shredded. Here's a little tip from Melinda, instead of using a fork to pull the meat apart like you are probably used to, put the chicken breasts in your stand mixer with the dough hook attachment . Turn it on and the dough hook shreds the meat in minutes! Once everything is shredded it's time to add the spice. Add Frank's Red Hot Sauce, cream cheese, shredded cheddar cheese and ranch dressing. Stir everything together and you have your buffalo chicken dip. Your jalapeños should be capped, cut in half and the seeds and white ribs should be removed. Wear gloves for this part!! Otherwise you'll wind up touching something later (like your eye) and regretting it. Those jalapeño oils are hard to get off of your skin. Stuff each half with a heaping tablespoon (more or less as needed) of buffalo chicken dip. If you don't want to wrap your jalapeño poppers in bacon, then you can sprinkle a little shredded cheddar cheese on top, press it into the dip a little to hold it in place, and you're ready to bake. If you are wrapping them in bacon, wrap a half piece around each jalapeño. When your jalapeño poppers are stuffed and wrapped place them on a baking sheet and put them in the oven on 400° F until the peppers begin to soften and the bacon is crispy. When they are done, pull them out of the oven, let them cool off a little and then you're ready to eat! Use ranch dressing, or sour cream mixed with guacamole or salsa, as a cool dip and enjoy! This is a great recipe for party appetizers. You can make the chicken dip and bacon a day ahead of time and the poppers can be stuffed and wrapped the day of the party then popped in the over right before guests arrive. Partially cook bacon, leaving it "floppy" so it can be curled. If not wrapping in bacon, sprinkle shredded cheese on top and lightly press it into the buffalo chicken dip so it sticks. If you are wrapping in bacon, wrap each jalapeño in half a piece of bacon. Bake in oven until jalapeños have softened and bacon is crispy. So, who's hungry now? The spice fiend in me just loves seeing all of those jalapeño poppers lined up and ready for stuffing! Remember to stop by Home. Made. Interest. to say hi to the gals and keep up with them on Facebook, Twitter, Instagram, Pinterest, and Google Plus! What an honor to be your guest post. Thank you! Thanks for having us today :) Hope everyone enjoys the recipe! O I love everything buffalo chicken! Those look delicious! You're welcome, and thanks for sharing! 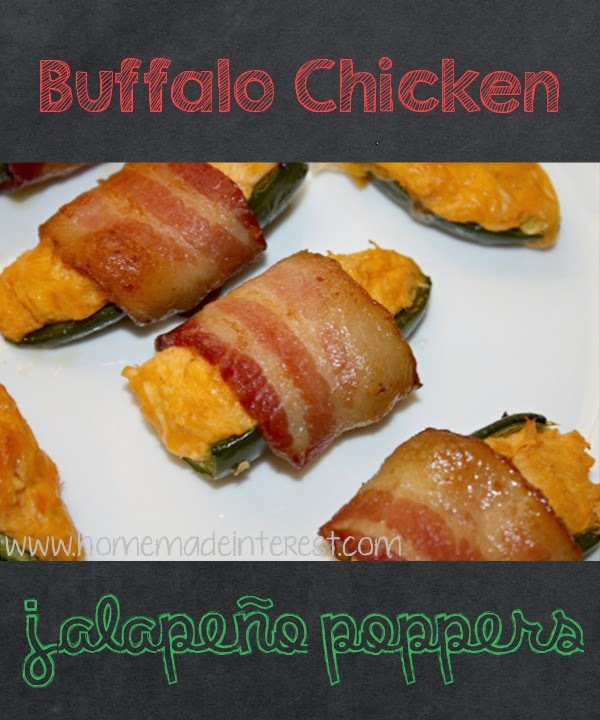 Your Buffalo Chicken Dip Jalapeno Poppers look amazing! Hope you have had a great weekend and thanks so much for sharing with Full Plate Thursday! Do these ever look delicious! Yum! I keep wanting to make something with jalapeño these look super wonderful.. thanks for bringing them to foodie friday. Wow these must have some kick to them...lol. I'm not sure I could eat these, but I'm sure super spicy lovers would really like these. Thanks for sharing the recipe on Merry Monday.